Odisha Gramin Dak Sevak Recruitment 2019 | GDS application form: It is an excellent opportunity for the 10th pass government job seekers. If you have successfully cleared the 10th standard then you can apply for the GDS post in Odisha Postal Circle. 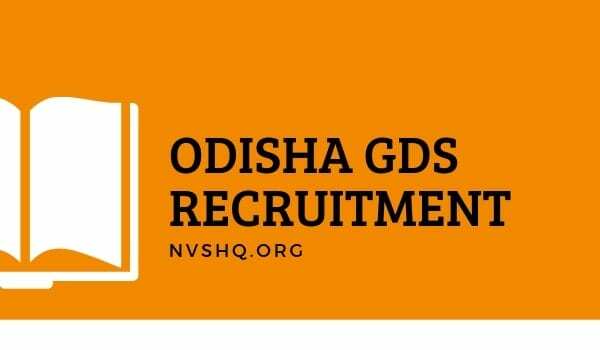 In this post, you will get all the essential information related to the recruitment notification on Odisha GDS application form 2019. Registration form from the interested candidates are invited for the recruitment of postman responsible to deliver the post in villages of states. Read the article carefully and if you are eligible for the above-mentioned post, then apply for it. We have mentioned all the details related to Important to process to apply for a job in this article. Odisha Gramin Dak Sevak has released the notification for the recruitment of Gramin Dak Sevak (GDS) in the state. Odisha Postal Circle has released the notification for the job of Gramin Dak Sevak. According to the notification, interested candidates will have to apply online for the aforementioned job. The application form for to apply for the post of Dak several are available on the official website of Odisha Postal Circle and application form are being submitted since 15 March 2019. The application submission will continue until 15 April 2019. Therefore, still, you have time to apply for the post of Gramin Dak Sevak. Candidates can apply for Branch Post Master, Assistant Branch Post Master, and Dak Sevaks according to the notification. Online Application form submission started from 15 March 2019. Last date to apply for the aforementioned job is 21 April 2019. Here we have mentioned the step-wise process to apply online for the post of Gramin Dak Sevak for Odisha state. Interested candidates can apply online for the aforementioned job and the process for this is really easy. The online application form to apply for the GDS Odisha is available on the official website of Indian post but before to apply online, first the applicant will have to register himself. Have a look at the process to apply for the discussed government job. Step 1: Register yourself at the by clicking on http://indiapostgdsonline.in/fee.aspx. You will have to mention basic information about you on this page. Please note that Registration is mandatory for applying online. After completion of registration, note down the registration number safe for further references. Step 2: Now you can apply for the GDS post through the registration number. Step 4: After uploading all the above mentioned documents, applicants can submit their application forms. Step 5: Click here to check the status of your application. Enter your mobile number and registration number and chose the Odisha Circle to check the status of your application. Interested male candidates from the category of OC/OBC/EWS will have to pay a fee of Rs. 100/- ( Rupees one hundred) for each set of five options. Female, SC/ST, and PwD candidates are exempted from the fee payment. The applicant can pay the application fee through online mode of payment using the URL provided in the Home page of the website. To submit the fee in offline mode, the applicant will have to visit any Head Post Office or other identified Post Offices In India and submit the fee there. All recognized Credit/Debit cards and Net Banking facility can be availed for the payment of application fee. To apply for the post of Gramin Sevak in Odisha circle, the applicant must have Secondary School Examination pass certificate of 10th standard with passing marks in Mathematics and English from any recognized Board of School Education. Apart from this candidate must know the local language. The ability of reading, writing and understanding the language is must for any candidate to apply for the above mentioned job of Gram Sevak. It is also must that the candidate should have studied the local language at least up to 10th standard. The applicant should have basic computer knowledge. It is must have the Basic Computer Training Course Certificate of at least 60 days duration from any Computer Training Institute run by Central Government/State Government or Private Institutions Organizations etc. Knowledge of Cycling is a pre-requisite condition for all GDS posts as he/she has to go to remote areas to deliver the posts. To apply for the post of Gramin Sevak, the minimum age of the applicant should be 18 years and maximum age should be 40 years. Candidates from the reserved categories will get the relaxation in age according to the pre-defined rules. The maximum age limit for the applicants from SC/ST is 45 years. For OBC candidates the upper age limit is 43 Years. PwD candidates from UR category will get relaxation in the upper age limit of 10 years, for OBC candidates it is 13 years and for SC/ST candidates the age relaxation is 15 years. The selection of the candidates will be based on their scored marks of class 10th. Marks of higher classes will not be considered. The officials of Odisha GDS Recruitment committee will make a merit list on the basis of job applications that will receive. Candidates with higher marks will get the job. In case of the same marks of two candidates, the elder one will get the job of Gramin Dak Sevak. No written test will be conducted to select the suitable candidates for the GDS. Minimum TRCA for 4 Hours/Level 1 in TRCA Slab for Dak Sevak and ABM is Rs.10,000/- (Rs.10,000-Rs.24,470/-). Minimum TRCA for 5 hours/Level 2 in TRCA slab for Dak Sevak and ABM is Rs.12,000/- (Rs.12,000- Rs.29380/-). Here we have compiled all the information associated with the recruitment of Odisha Gramin Dak Sevak. All the important links have been mentioned in the article where ever required. We would suggest the applicants to once read the official notification of the above-discussed job before applying for it. If you have any query related to the above mentioned Odisha GDS recruitment and application form government job, feel free to write to us. Please declare the selected candidate..And how we get that…??? And i have not gave my adhar number..And email..And caste is there any problem???? Why aren’t you providing any information about the release date of final result?? Duration of declared result from last date of form fill-up?? Sir I hv applied but don’t know when the result will come and how can we get to know whether selected? sir, after submiting the application form, can i add more branch option? Al\pplication Status not open. why Pay on line Fee. What happened site is not open ? what is the last date of apply for GDS post? Sorry, it’s not in our hand. Last date has already been extended. The site isn’t open. Please correct the server side issue. Its not server issue. Indian post department has removed registration link. We don’t know why. Date of results declaration please?? I AM UNABLE TO APPLY THIS FORM DUE TO SERVER ERROR. PLEASE CORRECT THE SERVER SIDE ISSUES , SO THAT I”LL FILL THIS FORM . I have not done any computer course, can I apply for this job. dear sister try till the last date . never give up . they removed the registration page , may be that will online after some days . hi sir i am radhakanta i loking for jobs. Sir applied kar chuka hun kiya me kuch post circle change kar sakta hun kia abi matlab ki me apni city ke as pas dalna chahata hun. How to edit the application? My Father’s name in the registration page is incorrect . How to solve the problem? Correction window will be open soon. Please wait. It has been extended to 21st Arpil. There was in site problem that’s why we are not able to apply. When will the merit list be declared?